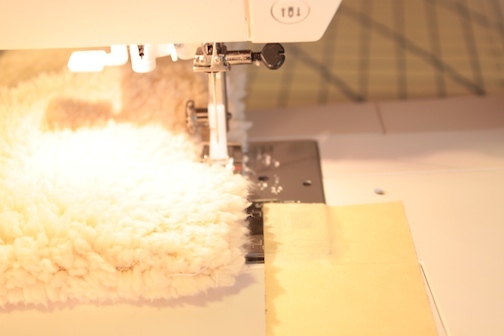 A sheepskin scarf is thick, so make sure your machine can handle it. Other than the thickness, I found it pretty easy to handle, just be aware of shedding, which can clog your machine. 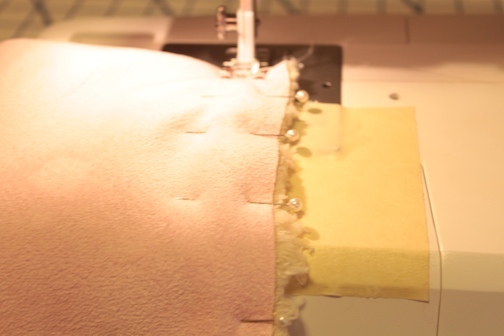 Faux furs, fleece, and other fabric that shed can cause havoc with sewing machines. Washing in advance can help. In this case, the side that sheds will be inside when gliding through the machine, so that will eliminate most of the problem. Just keep a close eye on what's going into your machine. When laying out the fabric, make sure it's cut straight. A cutting board like the one pictured above costs appx $20. If you don't have one available, use the corner of a table or a t-square to line up the fabric. Line up the selvage edge (machine finished edge of fabric) with the long straight line on the board, and the cut edge along the shorter side of the cutting board. You can also lay it out on a table, using the table edges to line up the fabric. If the selvage edge is lined up on one side, and the cut edge doesn't line up, then straighten out the cut edge by trimming it down to the line like the photo above. If you have a scarf that's the size and length you like, then that would be ideal. Just lay it down on the fabric, making sure to line it up along the selvage (machine finished edge of fabric). If you don't have a scarf, then just measure the length you'd like. 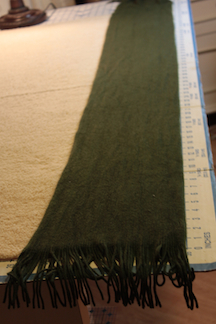 The scarf pictured here is a typical length and width, but is not near as thick as the sheepskin being used here. This scarf was about 18 inches wide. 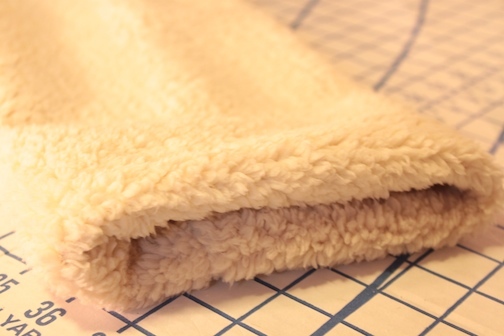 Since the sheepskin scarf will be doubled, then folded, that makes it 36 inches wide. 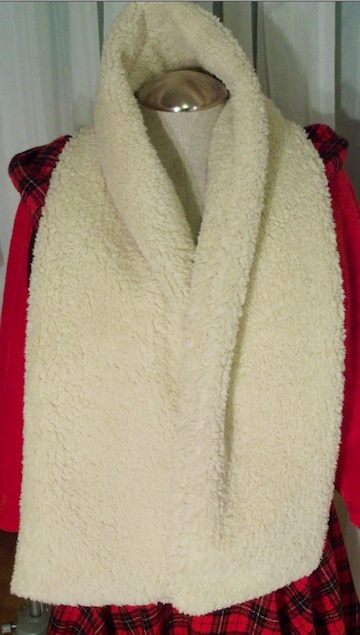 The length on this sheepskin scarf is shorter than the scarf template used here. In this case the scarf is for a man, so shorter would be more appropriate, although that's a matter of personal preference. After determining the width, fold the fabric in half with right sides together (as pictured above). 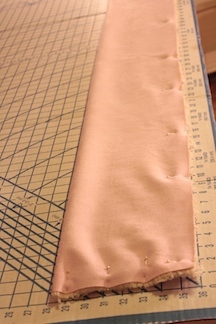 Keep the fabric straight by cutting it along the lines provided on the board every step of the way. Notice the fold (on left side) laying against one of the straight lines on the cutting board. Also notice the fabric is pinned together with all sides lined up along the lines on the edge of the right side of the cutting board. Pin fabric on the long side, and one short side, leaving one short side open, and sew. Through the opening, pull the fabric through, until it is all right side out, as pictured above. Turn in the edges as pictured here, again making sure they are straight, then sew. The sheepskin is thick, so when doubling it over like this, then hemming it, there's 4 layers of sheepskin. Make sure your sewing machine can handle that, otherwise hand sew this end closed. 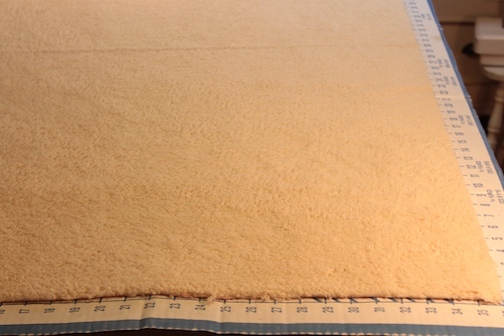 Because of the thickness the stitches easily hide in the sheepskin.